“I’ve got to run to keep from hiding,” The Allman Brothers Band sang once upon a time, and then Greg Allman gets an honorary doctorate from Mercer University bestowed by none other than former POTUS Jimmy Carter. We are not sure what to think about that, but it’s still pretty cool. We know what to think about some good food for you. Here’s what’s cooking for you this week: Louisiana red beans and rice, chicken carbonara with bow tie pasta, grits and grillades, and a fantastic Friday with blackened catfish over dirty rice. Special made Louisiana red beans and rice with hot water cornbread and house salad. Our red beans come fully and deeply flavored, cooked in our own house-made smoked ham hock stock that will totally set the week in motion. Ol’ Greg and the band wrote some great tunes, but none so magically musical as “Ramblin’ Man.” “Lord, I was born a ramblin’ man, trying’ to make a livin’ and doin’ the best I can. And when it’s time for leaving’, I hope you’ll understand, that I was born a ramblin’ man.” Of course, they joked on tour about being “rumblin’ men” and having to leave the room, well, because you know why…they loved them some beans. Beans equals blues, bus, and bike power. Yep. Chicken carbonara with bow tie pasta. We have bow tie pasta swimming in a creamy white sauce with lots of fine friends — oven-roasted chicken breast, mushrooms, garden fresh veggies, and green onions. Henry IV of England famously noted, “I want there to be no peasant in my kingdom so poor that he cannot have a chicken in his pot every Sunday.” Well, it seems the divine right of kings bows to the belly of the populace — and we thought Herbert Hoover and the Republicans started that “chicken in every pot” business. Look, Woody Guthrie got it right, “Left wing, chicken wing, it don’t make no difference to me.” Well, drop by for some chicken carbonara pasta, it will make a difference for you on hump day. 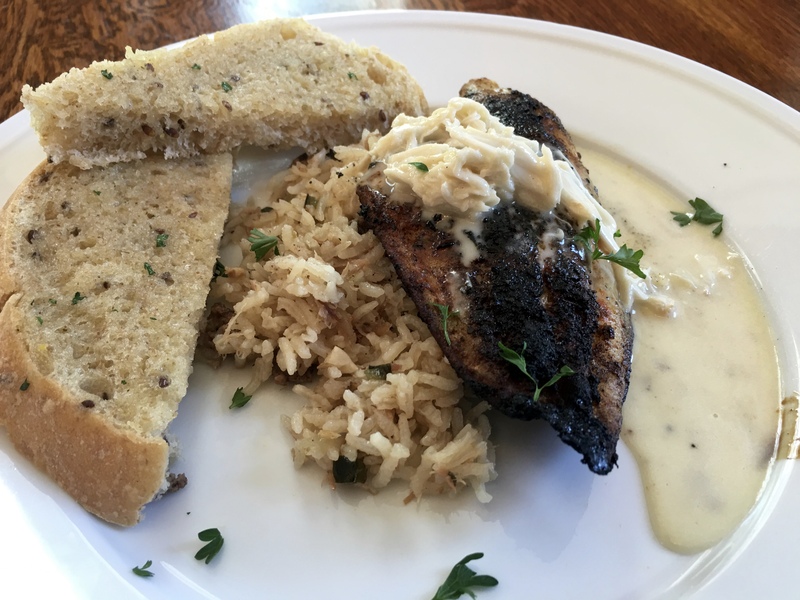 Blackened catfish with a mock hollandaise crabmeat sauce, dirty rice, and house bread, ($15). Seasoned like our old friend Chef Paul Prudhomme, we blacken the catfish in a white hot cast iron skillet, serve it atop dirty rice, add a little buere blanc, and put a little house bread on the side. Yummy. Greg and the boys channeled a really old blues friend, Robert Johnson, when they sang, “Come On in My Kitchen.” When it all goes bad, “You better come on into my kitchen, cause it’s sure to be raining outdoors. When a woman’s in trouble, everybody puts her down. She look for her good man, Lord he can’t be found. You better come on into my kitchen, cause it’s going to be raining outdoors.” Yep. Blackened catfish, the total cure for what ails you — come on into our kitchen. Have a listen to Robert Johnson’s “Come On in My Kitchen” or The Allman Brothers “Come On in My Kitchen” in a cool acoustic set to get you ready for the weekend. Greg Allman admits, “I didn’t think we would ever make enough money to pay rent by playing music.” Hmm. Previous PostTo Infinity and Beyond!